OTTAWA – With his life’s dream of representing Canada on the line with one shot, Kevin Koe delivered in dramatic fashion. Koe, along with third Marc Kennedy, second Brent Laing, lead Ben Hebert and coach John Dunn, earned the right to represent Canada at the 2018 Winter Olympic Games in Pyeongchang, South Korea, in February by edging Mike McEwen’s Winnipeg team 6-5 in the men’s final of the 2017 Tim Hortons Roar of the Rings. McEwen made the decisive delivery as difficult as possible with two rocks on the side of the four-foot behind cover. Four years of toil, tears and tons of ice time came down to this one shot of the tens of thousands the 42-year-old, two-time world and three-time Tim Hortons Brier champion has taken over the years. It looked good when it left his hand, but then all of a sudden sweepers Hebert and Laing realized they had to lean hard on their brooms to drag it toward the button. Kennedy rushed out from the house to give them help. When it stopped they knew they were going to the Olympics. The normally reserved Koe jumped for joy while the others fist pumped. It was a team shot that earned them a shot at Olympic gold. “It’s unbelievable. What a game. We beat a great team. It come down to last shot, I’m glad we had last rock. I honestly wasn’t sure it was going to make it, but what sweeping by the boys,” said Koe. “I felt pretty comfortable with draw weight, but really what I’m trying not to do is overthrow it, and give them a chance to sweep it. Never be heavy and take them out of it. I actually like it when I let it go. I think they did, too. “But it looked like it started coming down a little earlier. I looked up at Marc to see the look on his face and he came out to help sweeping. I’m just so happy for the team. 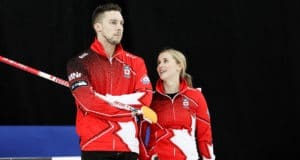 It will be a return to the Olympic stage for Kennedy and Hebert, who won a gold medal playing with Kevin Martin at the 2010 Winter Games in Vancouver. Hebert and Kennedy have a chance to become the first men’s curlers to win two Olympic gold medals. This will be Laing’s first trip to the Olympics as a player. He was in Sochi in 2014 to watch his wife, Jennifer Jones, win gold. “It’s the best birthday present ever,” said Laing, who turned 39 Sunday. Team McEwen certainly didn’t lose because of their skip. He curled 95 per cent, missing just one shot in the sixth end. McEwen went for the gusto, attempting to push the shot stone back to pick up a multiple score. While he did hit it, his shooter rolled just a bit too far and Koe stole a point for a 5-3 lead. “I gave it everything I had. I had one of my best games of the week,” said McEwen. “There wasn’t anything more to do. I would’ve like that one shot back for two (in the sixth end). It was really difficult. We did bounce back and we got the deuce to tie it, so it was a little bit of a wash but then it was kind of wasted. It took extra time to get it back to tied. 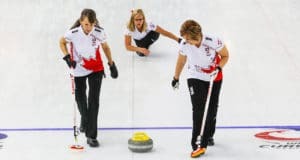 Although other curlers have said they were “gutted” when they lost out on such a coveted honour as playing in the Olympics, McEwen – supported by third B.J. Neufeld, second Matt Wozniak, lead Denni Neufeld and coach Chris Neufeld (B.J. and Denni’s father) – said he wasn’t. “I’m already over it. I know it sounds fake, it sounds surreal, but I was prepared for the emotions of winning and losing either way. A hundred per cent that’s genuine and real, I’m OK,” said McEwen. 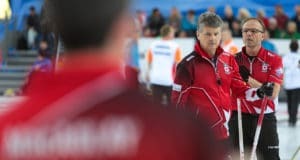 Koe’s crew continued the pattern of the first-place finisher in the men’s round-robin going on to play in the Olympics becoming the sixth team to do so since curling became an official sport. The victory means Koe will be invited to play for Team North America at the 2018 World Financial Group Continental Cup, in London, Ont., Jan. 11-14, 2018 joining 2017 world champion Brad Gushue’s rink from St. John’s and U.S. champion John Shuster.